I am holding my next hands on Face Painting class on Monday 9th and Tuesday 10th January at Southport on the Gold Coast from 9.00 am to 3.30 pm. I have trained with many International Artists including Brian and Nick Wolfe, Wiser Oner, Mark Reid, Jinny, Lyn Jamieson and many other fabulous Artists and have a wealth of knowledge from years of practice and experimentation to share. With over 23 years experience painting Watercolours, Murals, Acrylics and people, my techniques easily transfer from one medium to another. 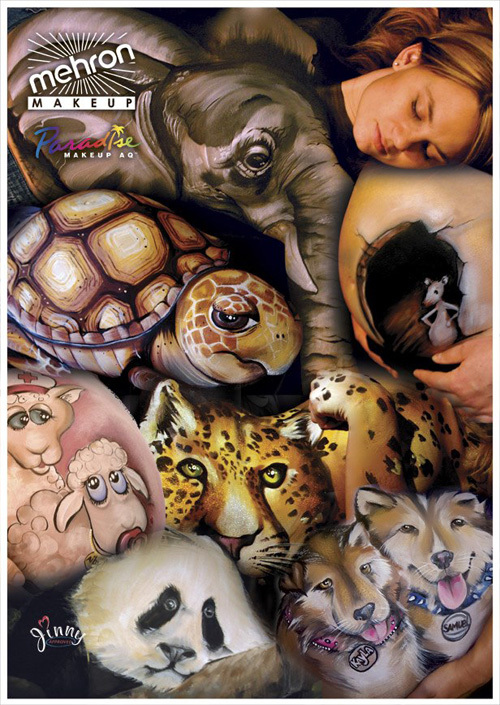 I have been face painting for over 13 years and am a multi award winning Artist in Watercolour, Face Painting, Body Painting and Special Effects. Day 1 class covers essential brush strokes and techniques, sponging and blending, using rainbows, how to work with the facial bone structure to adapt any basic design into what the client wants, basic faces like butterflies, tiger, dogs and spiderman, techniques for managing your customers , safety and hygiene, products and resources, insurance and anything else you need to know. Workshop costs $250 and includes a sample of TAG paints, sponges, glitter and 3 brushes- enough to practice all your new skills, or $220 if you have already purchased products from me. Day 2 in the morning 9am-11 am will cover a deeper level of what we learn in Day 1, including arm designs, cats, Superheros and flowers with many time saving tips and tricks. Day 2 afternoon session 11.00am -3.30 pm will be focussing on One Stroke Face Painting- brushstrokes, techniques and shortcuts to fast, impressive designs that will bust that queue! Day two costs $220 for the whole day- a previous course completion is a requirement if you are not attending Day 1. The fee is $400 if you attend both days. One Strokes, brushes, paints and other products will all be available for sale and you are welcome to sample paints from my kit on the days. I encourage you to bring your cameras, as there is a lot of information to absorb, and step by step images will help when you go home to practice, but please, no filming! I will be teaching Face Painting on Friday 3rd April in Bellfield (near Heidelberg & Preston) from 9am- 3pm $250 including a sample of face paints, brushes and sponges to take home with you, and $220 if you have your own products. Numbers are limited so call 0438020861 to book in so you don't miss out. This class covers essential brush strokes and techniques, sponging and blending, using rainbows, how to work with the facial bone structure to adapt any basic design into what the client wants, basic faces like butterflies, tiger, dogs and spiderman, techniques for managing your customers , safety and hygiene, products and resources, insurance and loads of tips and tricks. I will also give a quick guide to one stroke painting. 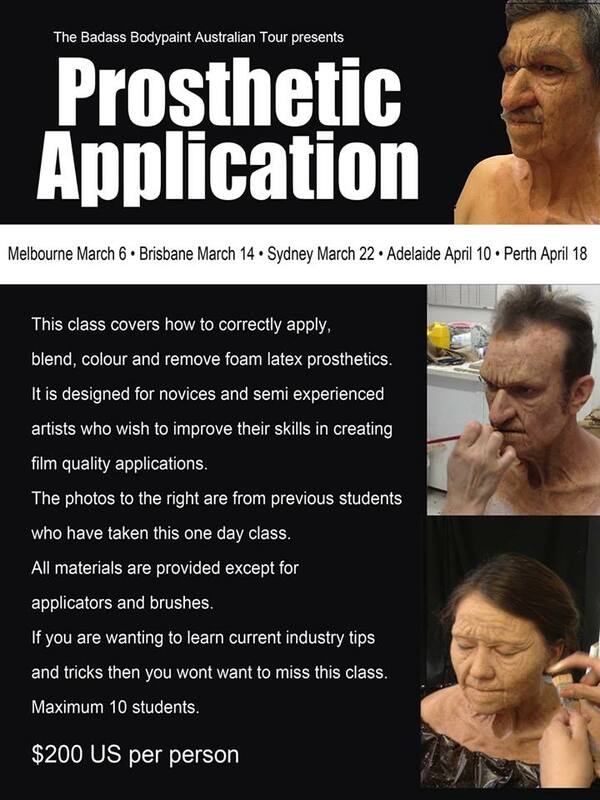 Want to learn AWESOME airbrush & Special Effects skills? 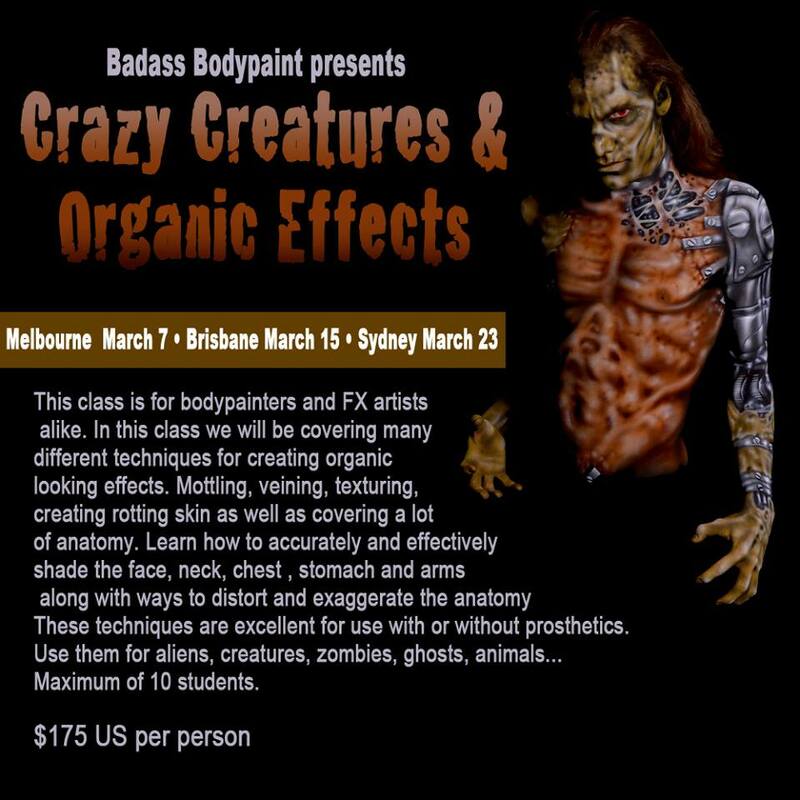 Josh Counsel from Badass Body Painting and Toxic Image Studios is touring Australia in March 2014! 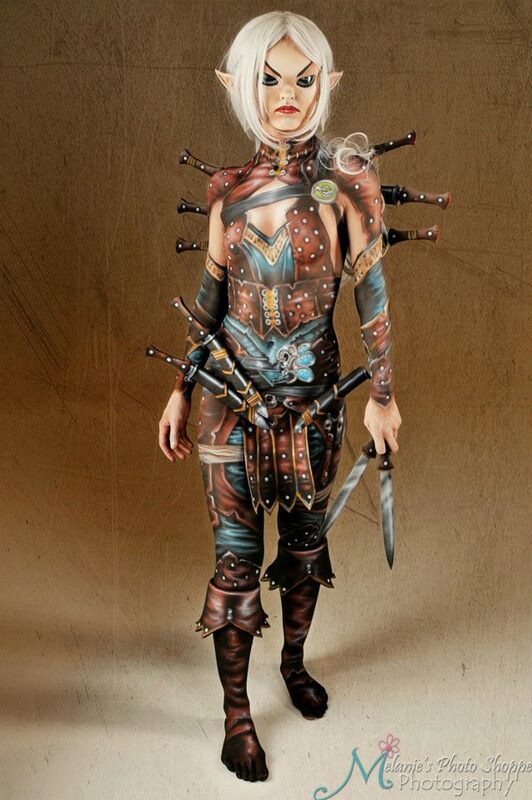 Learn how to paint convincing clothing and fabric effects. Learn how to correctly apply (working edges properly etc), paint (including underpainting, matching and layering) and remove a foam latex prosthetic. Appliances included. Learn how to paint things to appear shiny and metallic. Includes chrome and patent vinyl looks. We offer discounts for people wanting to do more than one class. The fourth class receives a 30% discount. For me to run any particular class I will require a minimum of 5 students. All deposits for all classes will be $100. The balance will be required on the first day of class. Any discounts will be applied at that time and taken from the remaining balance. All deposits are non refundable as they are what I am using to buy my airfare etc. The only time a refund will be given is if a class is cancelled by me. There may be some flexibility in the event of an emergency, but these will be considered on a case by case basis. 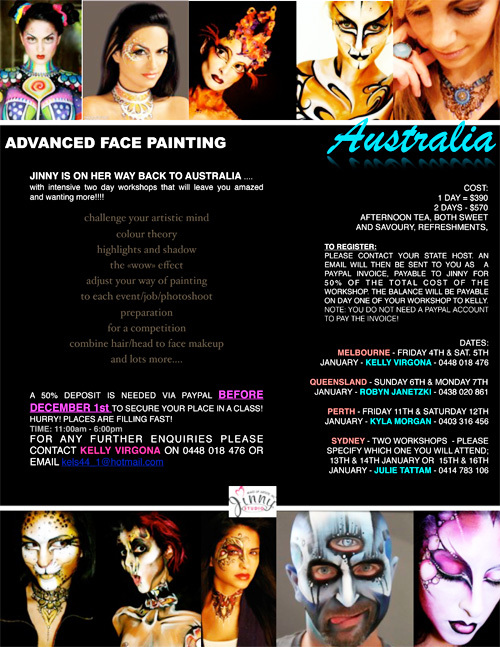 Jinny- Makeup Artiste from Canada is touring Australia in January 2013! Jinny's classes cost $390 for 1 day and $570 for 2 days, lunch, snacks and refreshments included in the price. With over 25 years years in this industry Jinny's knowledge base is immense, and her ability to impart that knowledge is fantastic! It will be a 2 day intensive demo and hands on workshop of jewellry, eye designs enhanced with gems and rhinestones, colour theory, creativity, using mediums in the hair to enhance designs, how to make designs flow from the face to the upper body, quick tricks for amazing designs fast and simple, and competition theory- how to prepare before and on the day for an award winning piece of art- info that will help with any Body Painting project. So, if you want to learn from one of the most amazing Artists in the world, please express your interest to me asap. This more for the intermediate to advanced class as Jinny will not be doing any basic brush strokes or focal point work, so a basic understanding of these things will be a big help.